A man who hijacked an Egyptian passenger jet and forced it to land in Cyprus has been arrested and Cypriot authorities say all passengers and crew "are safe," after hours of tense negotiations. The final captives on board the EgyptAir plane, heading from Alexandria to the Egyptian capital when it was hijacked, were seen exiting the aircraft on the tarmac of Larnaca Airport, after a tense standoff inside the plane. Cypriot authorities insist terrorism is not the cause of Tuesday's incident, despite initial reports the hijacker was wearing an explosive belt and had threatened to blow up the plane. According to Cypriot media, the hijacker, identified as Seif el-Din Mustafa, wanted to speak to his former wife, who lives in Cyprus. Arab media claimed the man was demanding prisoners in Egypt be released, but Egyptian officials denied the report. Unidentified people leave the hijacked Egyptair Airbus A320 at Larnaca Airport in Larnaca, Cyprus, March 29, 2016. Before the hijacker was arrested, Egypt's civil aviation minister Sherif Fathy said the exact level of threat was not clear. Fathy said security on the plane was good and the hijacker had not been able to enter the cockpit, preventing a more serious threat. Egyptian TV also showed video of the man going through a metal detector at Alexandria Airport before boarding. Cypriot President Nicos Anastasiades told local media a “domestic issue” was behind the hijacking. 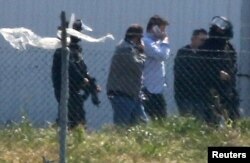 The hijacker's former wife, a Cypriot, was brought by local police to the airport to meet with him. Another EgyptAir flight from Cairo to New York was delayed due to a potential security threat. Egypt's aviation minister told journalists the plane was delayed both for security reasons and because passengers from the hijacked flight were due to board the flight. The incident appears likely to further damage Egypt's vital tourism industry, which had already been suffering from years of political unrest and a burgeoning terror threat.